Choosing the right pricing model can be key to obtain more paying users for your project. "All pricing is a guess (at first). But it needs to be an educated one." This quote is from Jory MacKay, who wrote an excellent article on The Psychology of Pricing. In his article, he emphasizes some key questions you need to ask yourself. What are your per-unit costs? What is your revenue target? What is your value to the customer? Who are your competitors and what is their pricing? By answering these questions you will get a better idea of the right price for your product. You are still guessing but you are better informed about the right pricing. So, in the next step, let's take a look at two fundamental economic concepts in pricing. A fundamental concept in pricing is demand. You want to figure out how many people would buy your product at $10, $100 or $1000. What you want to find out is the price with the highest revenue based on the price and the number of potential customers. Consumer Surplus is the difference between the price that consumers pay and the price that they are willing to pay. 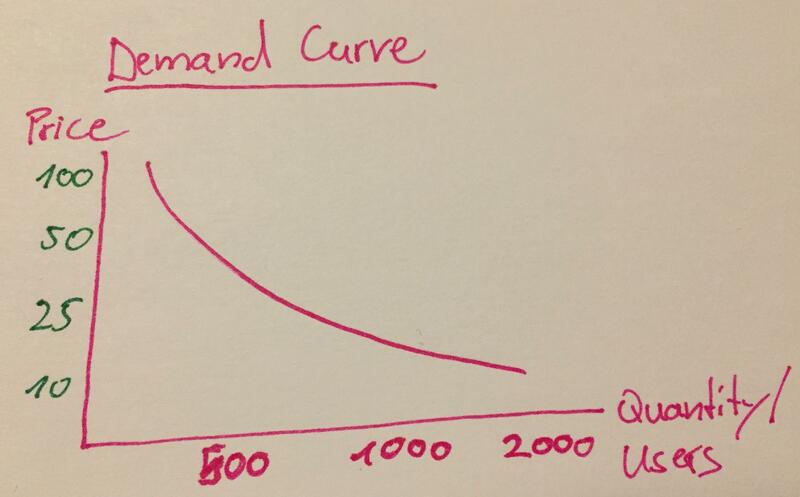 On a supply and demand curve, it is the area between the equilibrium price and the demand curve. To maximize your revenue you want to keep that difference obviously as low as possible. There are a lot of articles and studies about psychological pricing. Below is a collected list of some pricing strategies, based on psychology, that you can adapt to your model. Emphasize Time Spent vs. Saved - Analyzing which one rules consumer choices can be key to a good pricingUtilize the Power of Context: For example people will pay more for a “multimedia course” over an eBook, even if the information offered is exactly the same. First, let's take a look of different types of pricing models you could use for your project - Rachel Sears compared and contrasted the most commonly-used models for SaaS products. Big companies, like for example Stripe, make use of a usage-based pricing model. The more you use the service, the more you pay. This typically works fine with data services, cloud storage services, and recurring billing services . Adopting a freemium model is a great way to get your name out there in a cutthroat SaaS market by offering a bare-bones version of your product at no cost, with the ability to pay to upgrade or add more features. Whenever freemium is mentioned, tiered pricing often follows. This is one of the most commonly-used pricing models by SaaS companies. This is the most flexible and dynamic of all the pricing models. Users can essentially customize their own package by choosing which features they need, with the price adjusting based on what features they add “a la carte” rather than selecting a fixed tier. Companies like Trello are offering a pricing model based on the people that are using the service. In the following, we took a look at 50 StartUps in different business area and their business model. For the data we picked successful StartUps from the YCombinator Startup school in 2018, StartUps with a MRR > 25.000$ and some of our favorites StartUps like Canny. From the data and the examples we took a look at and the article of Upscope we can point out some key lessons. First of all, a lot of pricing models are based on a certain value you give your customer. Make a list with the values you provide your customer and build your pricing model based on that list. Often free plans can make sense for your pricing model. If you don't want to offer a free plan then at least think about offering free trials. Experiment with pricing - if you want to read more about experimenting with SaaS pricing then take a look at this great Canny blog post. It is ok to increase your pricing. Use A/B testing to measure Conversion Rates and Churn Rates at different price points. Let's take a look at some examples of other makers and their pricing model. Simple Analytics is an indie alternative for google analytics. The pricing model is a feature based pricing model.